Robert price can type 137 words per minutes on a desktop computer, and managed to achieve an amazing 115 words per minutes on a smartphone by using TREWGrip mobile qwerty keyboard. You may not be able to achieve the same speed yourself, but TREWGrip is an interesting portable wireless keyboard that should help you type much faster on your smartphone, or even mini tablets. It seems unintuitive at first, as the keys are actually located at the back of the keyboard as shown above, with illuminated indicator keys showing at the top showing where to type. The keyboard also have a 3-axis gyroscope to use it an an Air mouse. 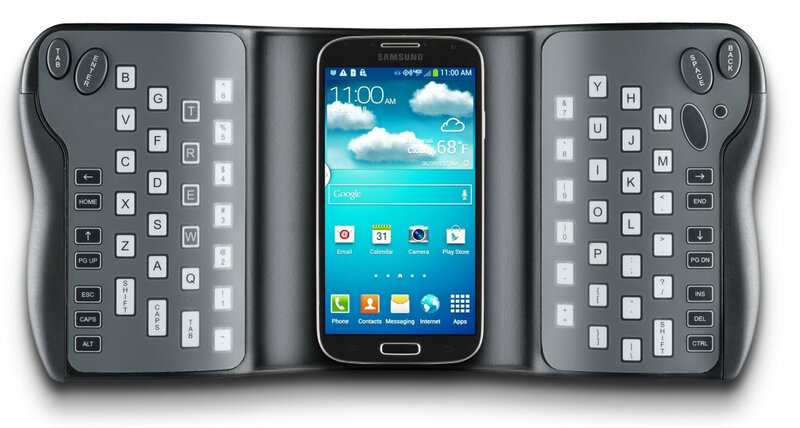 The keyboard communicates with your mobile device via Bluetooth classic. 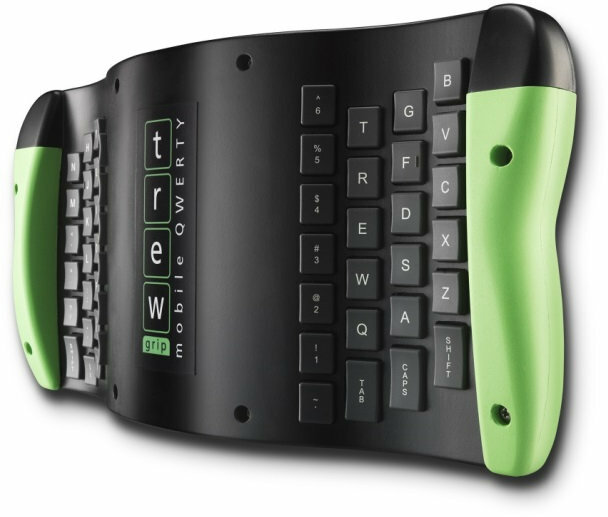 You’ll need some training to use this keyboard efficiently, but the company claims “the average user can achieve 90% of their QWERTY keyboard typing speed with only 8-10 hours of practice on TREWGrip”. The company explains it can also be used with a smart TV or desktop PC just like a standard Air mouse in their (failed) Kickstarter campaign page. To see how the device is used, and get a feel about the typing speed achievable in theory, checkout the following video from Cincy Typing Challenge. Despite failing to gather enough funds during their Kickstarter campaign, the company carried on with the project, and are now showcasing their wireless keyboard at CES 2014. The device is not available for purchase now, but during the Kickstarter campaign a standard pledge was $269, which to be honest, is quite higher than I expected when I started writing this post… You can find more information on TREWGrip.com.